Dispatches from Madrid, a city in political and economic turmoil. WALKING THE GALLERIES of one of Madrid’s many art museums, one sees, inescapably, signs of decay. As paintings age, they face ruin from a multitude of forces. Changes in temperature and humidity cause canvases to expand or contract; exposure to light causes discoloration; physical vibrations can lead to paint loss; air pollutants eat away at varnish; and neglect, combined with these, allows damage to proceed unchecked. Museums, of course, do everything they can to frustrate such forces, and art restorers bring sophisticated tools to bear: hot air pens, heated spatulas, low-pressure suction tables that relax distorted canvases. But there is only so much the experts can do. Some works are too far gone; they will never again be as they were. Present-day viewers behold a Madonna’s alligator arms, her Babe’s flaking halo, and try to piece together, from the beauty that remains, an uninjured, original image. Madrid presented itself to me initially as a beautiful painting, a tableau Tintoretto could have loved, dramatic and invigorating. But during my time there this past fall, I began to see more and more, in the substance of what was beautiful, the cracks, the signs of distress and neglect, fissures splitting wider in the ancient stones. I had taken up residence in a private room in a marble-floored hostel on Gran Vía, in the heart of the city. Every day the cleaning woman would rouse me with a knock, and I would stumble to the door on half-dreaming feet, trying to sort out the jumbled languages in my head so as to give her a response. Even in tourist-heavy areas hardly any Spaniard speaks English, not even the simplest of phrases. Only a small number of educated young people have anything like conversational English, and many have already left the country for greener pastures. As in much of the developed world, youth here increasingly feel as if they have been robbed of the future. But in Spain it’s more problematic than elsewhere to appeal to the past. The past is all around you, but it is not kind. In many minds, the fascist Spain of Francisco Franco still lingers. One piece of this past — the memorial El Valle de Los Caídos outside Madrid, which includes the world’s largest cross, and a basilica containing the bones of Franco himself — was reopened to the public in June of 2012. Is there another developed nation that has a standing monument to a dictator, built by the forced labor of the defeated? The bodies of dead Nationalists in the valley below were moved there on Franco’s orders. “Fallen for God and for Spain,” the inscription reads. The Spanish attitude toward the late dictator is not like the anachronistic pride of the French for Napoleon, whose militarism they would not now condone in a leader; it is nothing but revulsion. And yet until 2007, when the Law of Historical Memory was passed which ordered their removal, there were as many tokens of Franco’s legacy in Spain as there are of Napoleon’s in France. Here the past is more than usually present. Every street and open space in Madrid seems to have been the site of something historic: Lope de Vega premiered his plays in this plaza, Cervantes’s bones rest in that convent, the echoes of Franco’s public addresses linger in another plaza. The liberalization that accompanied the return of democracy has slowed, even reversed since the economic collapse. The moneyed set clings to tradition. Conformism, not individualism, is prized. Unemployment is at 25 percent, and among young people it’s more than double that number. There is still the famous nightlife: tourists and madrileños mingling on Gran Vía, in the all-night discos and in the tiled bars of Huertas. But just off the main thoroughfares are side streets which look abandoned, most of the shops shuttered, and those still open mostly empty. In a cocktail bar in Conde Duque, a glove shop near Puerta del Sol, a Japanese-owned tavern near Plaza de España, I was the only customer. Nor in these establishments was there any company to be had other than televisions blaring endless football. At night Chinese immigrants sell one-euro beer illegally on street corners, hiding their stashes in nearby trash receptacles; or, in the cobblestoned back streets, walking openly with six-packs dangling from their hands. Spaniards are chagrined by this midnight economy, but they keep the euros coming. There is an intensity to life in the Spanish capital that feels like making up for lost time. Madrid afflicted me with restlessness. Nights I went out drinking in the oldest parts of the city, or running on Gran Vía long after the crowds had dispersed, enjoying the boulevard all to myself save for a few drunks, familiar beggars and stylish young couples seeing each other home. From my fourth-floor balcony I would watch dawn break over the luminous red clock face of the Telefónica Building, then drift off, soon to be awakened by car horns on Gran Vía, an inevitable morning chorus like angry voices rising in concert at an execution. I never lacked for company at night. Young locals drink at home before going out, their beverage of choice being calimocho, a concoction of cheap red wine and Coca-Cola. Slightly older professionals can afford bar cocktails. Everyone parties, but beneath the fervor is uncertainty. “Do you think I can survive in England?” a woman named María asked me one night. Her English was better than most, and she was about to complete a PhD in biology before moving to Birmingham for work. She’s a third-generation madrileña, but there are no jobs in Madrid. In London, I thought, claro, but in Birmingham? The bar had posters of Depeche Mode and Nirvana — no, the Muppets dressed as Nirvana — and was playing American alternative rock hits from eight years ago. On another night, Jonay, a freshman at Complutense University, looked at me across a table littered with empty beer cans and plastic cups of calimocho in his student apartment, and tried to form a question but couldn’t find the words. Finally he used his mobile phone to look up the English word for publicidad — advertising — which is what he’s studying. “Advertising jobs en Nueva York?” he asked hopefully, because New York is where I’m from. Yes, of course, I said, hoping the next four years would improve his English. In late September, that return of the real took the form of massive protests in the city center, complete with riot police and rubber bullets. The weather turned ugly; the city became militarized. Police vans were everywhere. I could no longer reach my room by car, as the streets were blockaded. Older madrileños apologized for their city. It’s usually nice and quiet, they said. Even cabbies were surprised by all the police wearing body armor, and warned me against taking pictures. When I tried anyway, the officers looked me dead in the eyes and shook their heads. At first I wanted nothing to do with the protests. I was in the Museo Thyssen-Bornemisza looking at 17th-century Dutch landscapes when the roar of the crowd outside, penetrating the walls, became unignorable. “It’s happening every day,” a museum employee said. “Everyday more strong.” Joining the press of humanity on Paseo del Prado, along the length of which police vans were massed like rhinoceroses at a watering hole, I ended up in Plaza Cánovas del Castillo, where the atmosphere wavered between jollity and fury. Protestors had converged from all sides on the fountain of Neptune. It was like a block party: beer-sellers moved through the crowd hawking their goods, everyone was drinking and smoking or cajoling friends by phone to come and join the scene, and a man was urinating in a nearby bush. Here was life in all its rude colors. There were chants, whistles, synchronized clapping, sustained mass screams. Signs declaring NO and “Democracia! No nos representan!” bristled from the tightly packed crowd like porcupine quills. When I visited San Lorenzo de El Escorial it was a gray day, unseasonably cold; all afternoon the sun hammered out corrugated sheets of cloud on the anvil of the sky. As I prepared to enter the basilica, the bell tolled seven o’clock and a light rain began to fall. An indescribable silence reigned inside; a few votive candles burned in the darkness. Alone in that cavernous space, I felt something like holy awe. I tried my Spanish on the sole attendant, and she pointed out for me the reliquaries to either side of the opulent nave, which contain, she said, an untold number of saints’ bones. According to one estimate they hold 10 whole bodies, nearly 150 skulls, and more than 300 arms and legs. Hungry after touring the basilica, I climbed a flight of stone steps into the town proper in search of a meal. By the time I left the café, darkness had fallen like the Roman Empire. El Escorial loomed up above me, and unbidden came the words of Gerard Manley Hopkins: “hulk-of-all, hearse-of-all.” The tourists were gone and there were no taxis now. The night had grown strange and complicit around me. I could easily have crossed into the empty, windswept courtyard, but something prevented me. What I beheld there was a whole undigested history, a seat of power in constant retreat from life. Its weight at my back oppressed me as I made the long descent toward the train station through the unfamiliar town. “You will never discover the Spanish soul alone,” a teacher named Silvia, flush with drink, told me on a happier occasion. “You must be in the company of Spanish people.” Couples nearby were dancing to “A mi manera,” a flamenco rendition of Frank Sinatra’s “My Way.” Once the personal librarian of former Prime Minister José Luis Rodríguez Zapatero, Silvia liked me instantly when she saw the volume of Cernuda’s poems lying on my table at the wood-paneled sherry bar where I’d fallen in with a couple of middle-aged expatriates. She was surprised that I knew of him. Spain eats her poets. Cernuda died in exile, Miguel Hernández in a Falangist prison. Lorca was murdered by Franco’s goons. I split a bottle of manzanilla with her and her friend Jorge, a somewhat mad former handyman turned painter, and talked with them about the Spanish soul. During my time in Madrid I had many conversations like this one, conversations the Spaniards punctuated with endless cigarettes, until I began to feel like Diogenes with his lamp. “Madrid, to me, is the greatest city in the world,” said María on another night. But there’s no home for her there any longer. After El Escorial, what I noticed in Madrid was the way everything is ghostlike, but nothing ever really vanishes, not even the millions who, for how brief an interval, lent to the stones of the buildings their respiration, the way the stones still keep their memory. 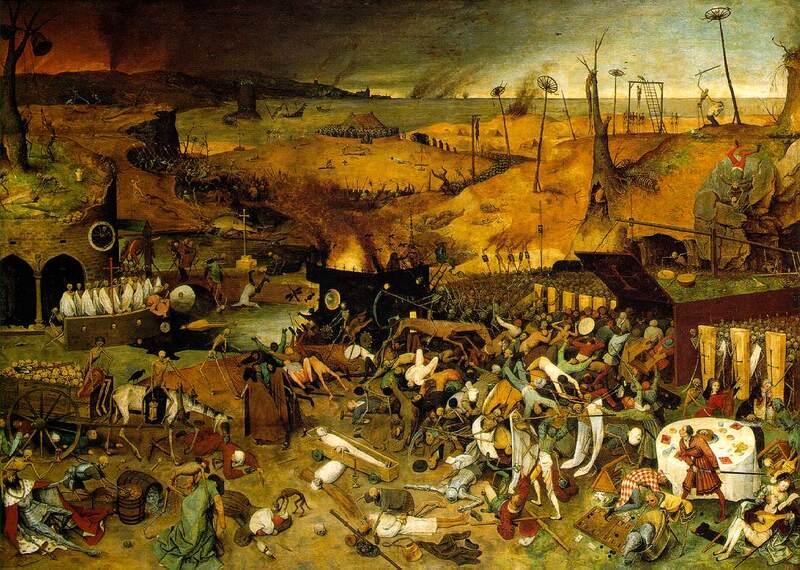 Seeking relief or some kind of perspective, I made my way to the Museo del Prado — the repository of artistic treasures once hoarded by Spanish kings — where I was drawn ineluctably to Pieter Brueghel’s The Triumph of Death. So long was I absorbed in the panel, which measures approximately four by five feet, and so shattering was the experience, that I almost feel I can still recall the entire apocalyptic panorama with absolute accuracy, down to the smallest detail. Certain elements of the nightmarish scene, such as the wheels mounted on tall poles to which men are confined, one per wheel, must seem surreal to modern eyes: hellish devices thrown up by the fevered brain of the painter. And yet they have a basis in historical fact, and reflect the genius for cruelty that found fulfillment in the Spanish Inquisition. Though spindly and crooked as the legs of a Dalí elephant, the infernal nature of these devices in the painting, which pertain to a form of execution known as breaking on the wheel, is only slightly exaggerated from reality. On one wheel, a dark bird perches menacingly. Flanders in the time of Brueghel belonged to the Spanish crown, and it seemed to me then, on that day in the Prado — nor have I been able since to lay the ghost of this impression — that mankind in the Spanish imagination is like one of those men on the wheel: guilty of terrible crimes, condemned by unimpeachable forces, and suspended between earth and heaven in a state between life and death, over the agonized body of whom the dark bird of history gloats hungrily. Two hundred kilometers northwest of the stone that marks Kilometer Zero in Madrid’s Puerto del Sol is the city of Salamanca, famed for its lion-colored cathedrals and its university, where Cervantes and St. John of the Cross once studied: a golden city to which atheism never came. Its economy, except for what stimulus is brought by 30,000 university students, depends entirely upon tourism. It is one of those European cities that have become open-air museums, where things are preserved so that people from places where things are not preserved will have something to marvel at on vacation. But there is more. At Calle Gibraltar número 2, an address not mentioned in guidebooks, stands the Historical Memory Documentary Center, the repository — except for certain records delivered to the Basque people — of the complete archive of the Spanish Civil War. Here, then, are the surviving documents of Franco’s government. They are available to the public. Royal decree has preserved this eloquent testimony of atrocity so that the people might no longer remain in forgetfulness. On Don Juan’s magnificent tomb in El Escorial is a Latin inscription: “For the memory thereof is immortal.” But memory changes as it becomes history. A monument erected to a dictator’s glory becomes a lucrative tourist destination. Internal memos become testimony to future generations. What will they remember of contemporary Spain? Can it have a present when its past is so unquiet? The Documentary Center is barely five years old, and bodies continue to be brought up from unmarked graves all over Spain. Memory is not innocent, because we are not. It is always in collusion with our agendas, our prejudices, our fears and our desires: it takes sides; it fades or grows beyond our intentions, recalls more than we want to recall. It’s the marvelous ability of individuals to precipitate events so large that no individual can reverse them. It took only one man’s gun to cancel Lorca. The evidence lives on after us and reveals more than we might wish to future generations. Pharaoh Akhenaten writes a hymn to the sun, and more than 3,000 years later we know something of Egyptian religion. Our foolishness and perversity, which may be invisible to our contemporaries, will surely stand naked in the full light of later scrutiny. In the end, we get away with nothing. Paul Mandelbaum on "Middle Men"